The Global Positioning System (GPS) receiver on board any drone is a critical part of the systems that allow a drone to fly. Only the very simplest of drones don’t include a GPS receiver. All drones rely heavily on their on-board GPS receiver to determine their location. Without a GPS receiver, features such as position hold, waypoint navigation, return home and geofencing simply will not work. The GPS system is probably one of the greatest technical achievements of the last twenty years. The ability to receive signals from satellites circling the earth is one of the most impressive aspects of this system. The signal from the satellites are so weak that detecting them is the equivalent of detecting a light turning on in Tokyo from San Francisco. A signal this weak is easily blocked by interference from other transmitters or electronic devices. The fact that those devices are on the UAV right next to the GPS receiver and antenna means that special care must be taken to ensure that none of these systems interfere with the GPS signal. This is not just a problem that must be solved during integration but it is a production problem as well. The variation from one component to the next can cause interference to vary from one system to the next. In addition, faulty components can create interference on some drones that appear identical to others where no interference exists. Since the GPS signal is so weak and there are so many sources of interference on a typical drone, testing the correct operation of the GPS receiver is an important part of any drone manufacturer’s quality control process. Often, drone manufacturers will use a GPS re-radiator in order to test their drone’s GPS system. A GPS re-radiator is a device that brings the GPS signal indoors. It is a very simple device that consists of an RF amplifier and two antennae. One antenna is placed outside of the building and is connected to the input of the RF amplifier; the other antenna goes inside the building and is connected to the output of the RF amplifier. They form a cheap and effective means of bringing the GPS signal indoors. Before you get too excited about using this signal for indoor positioning, I should mention that the re-radiator interferes with the GPS position. The fact that all of the GPS signals go through a single point (the antennae and amplifier) disrupts the path the GPS signals would normally take to your receiver and so interferes with the position calculated by your receiver. Still, a GPS re-radiator will at least allow your GPS receiver to lock. If your GPS receiver won’t lock under a GPS re-radiator then you can be certain that it has a major fault. GPS re-radiators have several disadvantages. The first is that they significantly increase the signal strength of the GPS signal. This can mask many problems in your GPS receiver. It is quite common for systems that work fine with a re-radiator to struggle with reception when used outdoors without the benefit of the amplified GPS signal. Another problem with re-radiators is that they can adversely affect normal GPS reception in the area they are used. The signal the re-broadcast is so much stronger than the normal signal from the GPS satellites that GPS receivers in the vicinity might lock on to your re-radiator instead of the proper GPS satellite causing them to report the wrong position. The final problem with GPS re-radiators is they rely on the GPS satellites for their signal and this signal is constantly changing as the GPS satellites orbit overhead. Therefore, the test is not repeatable and your results will vary depending upon the atmospheric conditions of the day and the positions of the GPS satellites. Ideally, the test you use to determine that your drone’s GPS receiver is working correctly should be repeatable. Every time you run the test, the same system will produce the same results regardless of the atmospheric conditions or the configuration of the satellites. In order to make the test more repeatable it is best to use a GPS satellite simulator. There are a wide variety of GPS satellite simulators available that can simulate dozens of satellites simultaneously. These simulators typically cost much more than one-hundred thousand dollars. Fortunately, these expensive multi-channel simulators are overkill. If you just want to test the effectiveness of your GPS receiver you just need to simulate a single satellite. If you have a satellite signal with a consistent strength you can easily test your GPS by simply looking at the signal strength of this one satellite. If the signal strength is high enough then you can be confident that your GPS receiver is working properly. The easiest way to use a GPS simulator is to plug the simulator into the GPS receiver instead of the GPS antenna. This allow you to detect any problems with their cabling inside your UAV as well as any power supplies, or other devices, that may be generating interfering signals on the internal power supplies. What this setup won’t do is find sources of interference that will enter the GPS receiver through the GPS antennae. There are many RF sources on a typical UAV. Data links, video transmitters etc. If any of those have faults they could easily degrade the GPS signal. Since these signals all enter into the GPS receiver via the antenna taking the antenna out of the loop means you won’t find their problems. The simple solution is to leave the GPS receiver antenna connected and connect the GPS simulator to a second antenna and allow the signal to enter the system as it would in normal use. This is actually more complex than it sounds. It is not a good idea to broadcast simulated GPS signals. As with the GPS re-radiator, these signals could be received by GPS receivers in the vicinity and adversely affect their operation. As GPS is widely used in communications and aerospace it is not wise to intentionally broadcast signals that might interfere. In order to protect against interference, it is best to place the UAV and antenna connected to the GPS broadcaster inside an anechoic chamber. This prevents the release of any simulated GPS signal and has the added benefit of isolating the system from the regular GPS signal. The GPS system is a critical to the correct operation of all UAVs. As we have seen, the signal strength of the signals broadcast by the GPS satellites are extremely weak. Not only can interference completely block the position information, lower levels of interference can cause more subtle effects that reduce the accuracy of the positions information generated by the system. 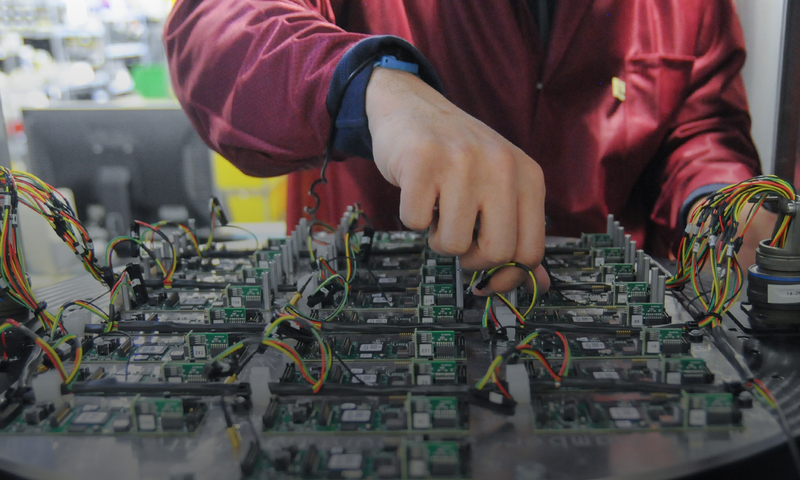 A proper test of the on-board GPS system is a critical part of any professional UAV manufacturing process. Previous PostPrevious Going, Going, Gone….